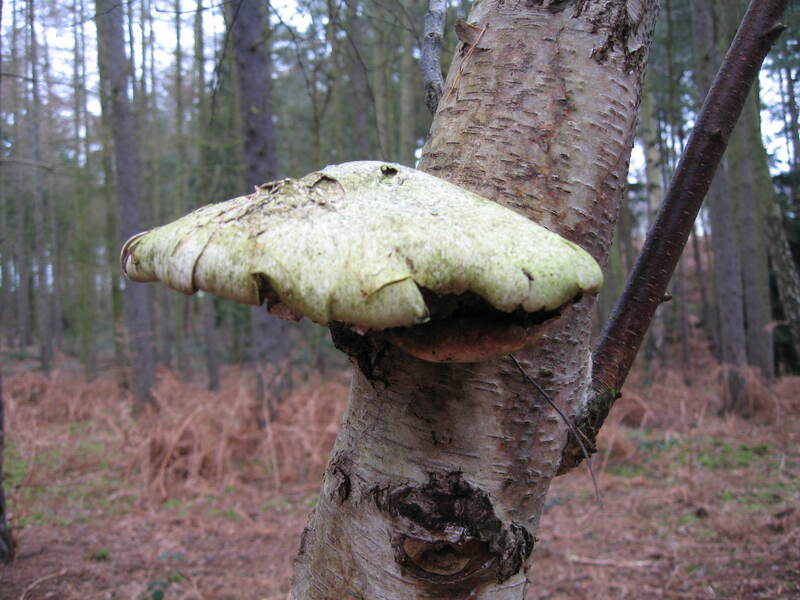 January is not the best month for harvesting plants for dyeing but it always seems to be possible to find something with dye potential, no matter what the time of year may be. During my recent walk in the woods, I collected some fallen fir branches & some brown oak leaves & birch bark from the woodland floor. The birch bark is waiting for me to strip off the useful sections & soak them in water, but the fir leaves & oak leaves have already found their way into my dye pots. 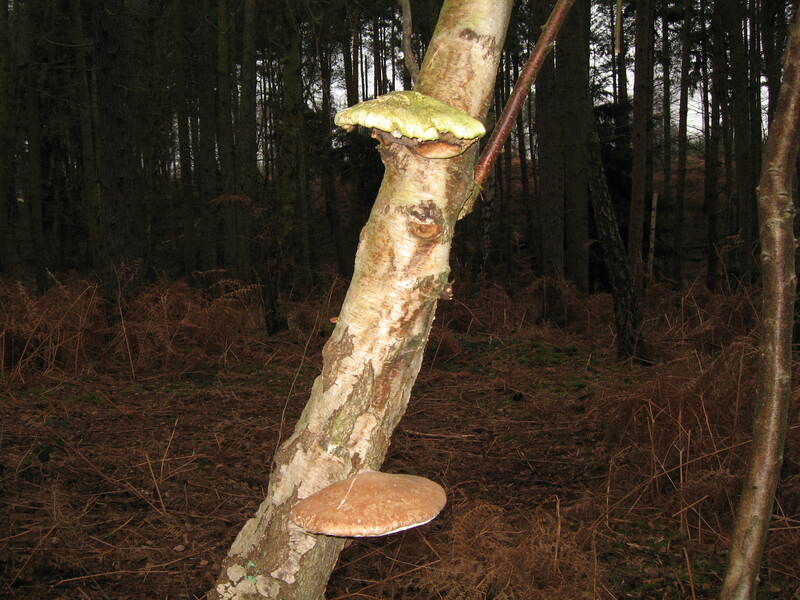 Although they didn’t produce remarkable colours, they make a pleasant reminder of a delightful afternoon spent foraging at leisure for woodland treasures. This shows an alum-mordanted skein dyed in a dye bath made from the fir leaves on which the skein is sitting. 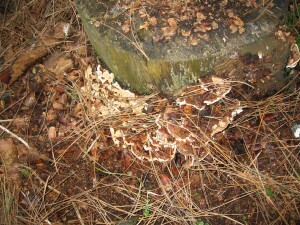 This shows the results of a dye bath made from the fallen oak leaves on the left of the picture. From top to bottom the skeins are: alum mordant, no mordant, no mordant plus iron modifier. Although these brown & grey shades may not have the “wow” factor of more brilliant colours, they provide useful contrasts to set off brighter, more vivid shades. 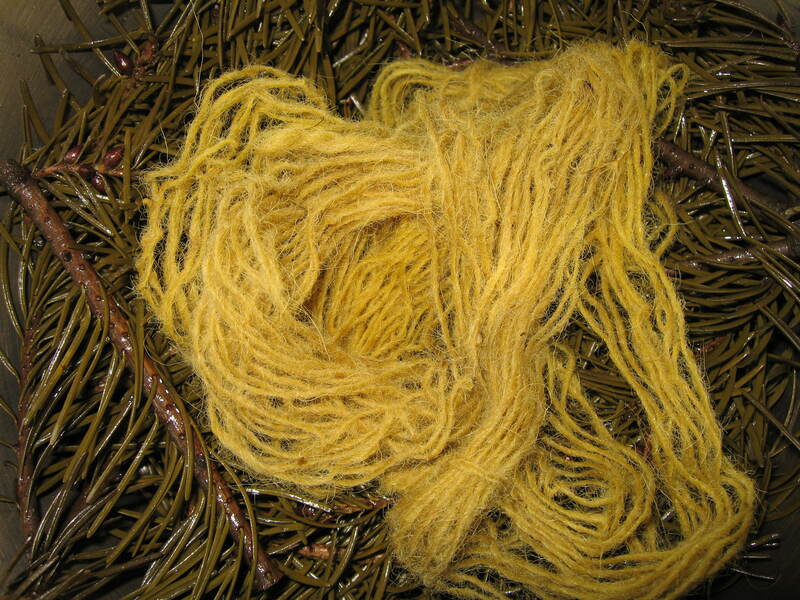 I have now managed to try out the acidic modifier on skeins from the Eucalyptus gunnii bark dyebath. 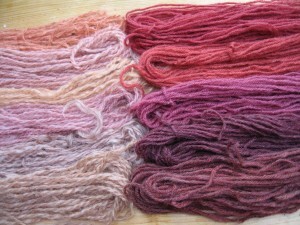 The skeins on the left were mordanted with alum & those on the right were unmordanted. The acidic modified samples are second from the top in each case. It would appear that this species of eucalyptus follows the usual pattern of modifiers & the acidic modifier has lightened the shade. But it was worth doing the test just to make sure. 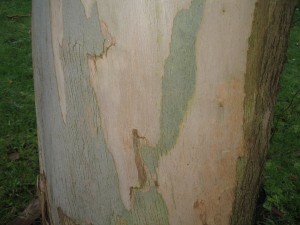 This image shows some colours from Eucalyptus gunnii leaves. 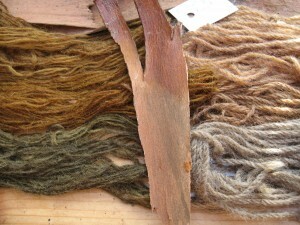 The wool on the left has been mordanted with alum, the wool on the right was unmordanted. From top to bottom, the samples are: no modifier, plus alkaline modifier, plus iron modifier. NOTE: As it’s usually the alkaline & iron modifiers that give the most interesting results, I limited these tests to these 2 modifiers only. However, I have just read that some eucalyptus dyes react better in an acidic solution, so I may have made the wrong choices. NOTE TO SELF: Do not try to take short cuts by not testing samples across the full range of modifiers. The modifiers omitted might be the ones that give the most interesting results. This image shows the results of a dyebath of Eucalyptus gunnii bark on alum-mordanted wool (left) & unmordanted wool (right) From top to bottom the samples are: no modifier, plus alkaline modifier, plus iron modifier. The same comments on not missing out modifiers apply here. 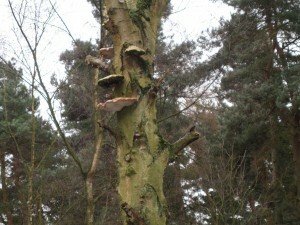 I’m afraid I’m still working on my skills as a photographer! This magnificent Eucalyptus gunnii in our garden was grown from a seedling planted about 25 years ago & is now over 30 metres high. 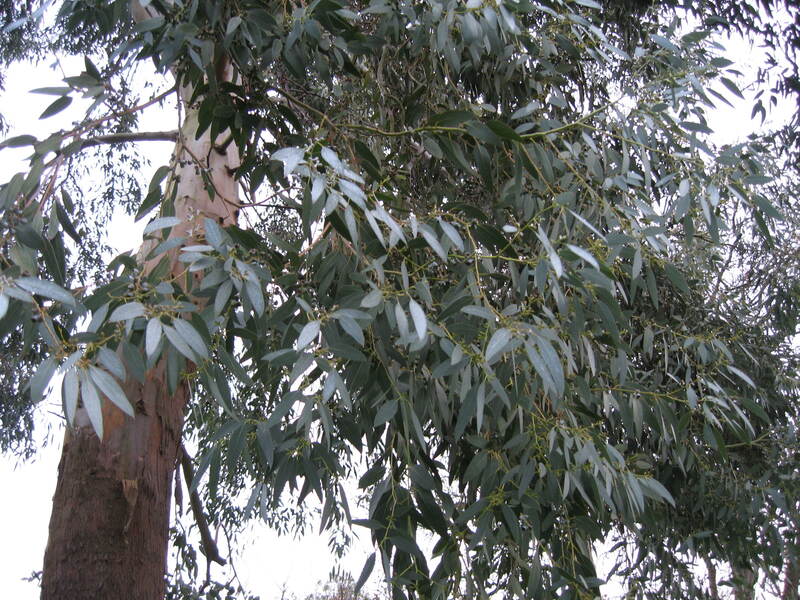 It is one of the most hardy varieties of eucalyptus & seems to thrive in our climate in the SE of England. Dyes from eucalyptus leaves & bark can give pretty colours, usually ranging from tan & yellow through to rust & red. 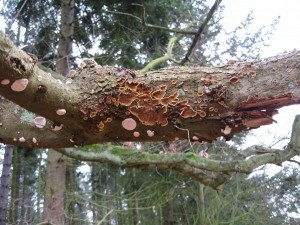 I believe there are species that give other colours too. 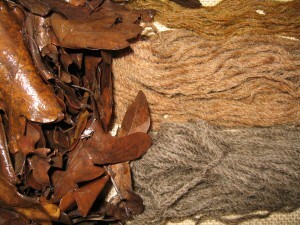 In my experience, a dyebath from leaves or bark tends to take a long time to prepare, as it can take several hours of simmering to extract the colour. However, I have been advised by India Flint, an expert on eucalyptus dyeing, that prolonged simmering may dull the brilliance of the colours & that it is better to simmer for no longer than an hour before straining off the dye liquid. 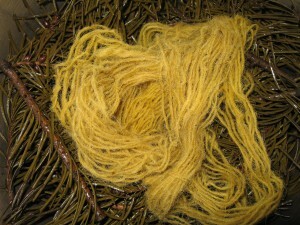 The fibres should then be steeped in the dye solution for several hours. 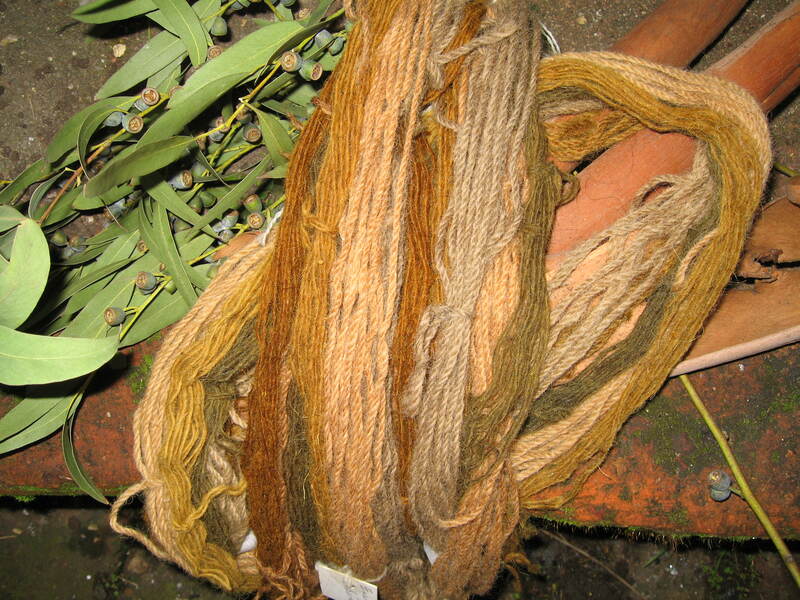 Dyes from eucalyptus will fix without a mordant, although the use of an alum mordant usually deepens the colour. 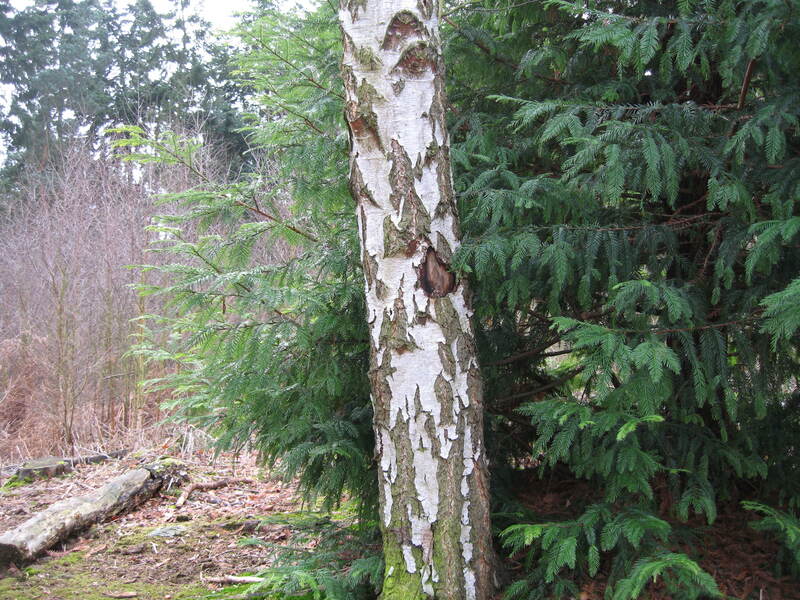 One of the features of this tree is the way the bark sheds itself in large sections, revealing interesting silver, grey & green patches on the tree trunk. If I don’t manage to get to it first, my husband collects the fallen bark & uses it to start off a fire in his metal brazier. These fires are lit on the pretext of either needing to burn garden waste unsuitable for the compost heap or needing to dispose of letters etc which have our personal details on them. But I think he lights his fires for the sheer pleasure of spending a winter evening alone with his thoughts in the garden, enjoying the warmth of the blaze. And why not? Sometimes I join him & I can understand the attraction of this activity. 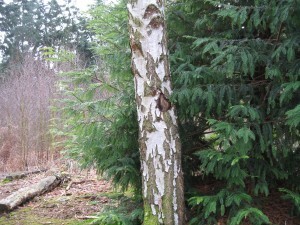 Details about my recent dyeings with the bark & leaves from this tree will follow. 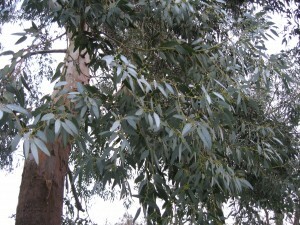 But don’t expect to see the reds that are apparently possible from this species of eucalyptus. I’m afraid they have eluded me so far. 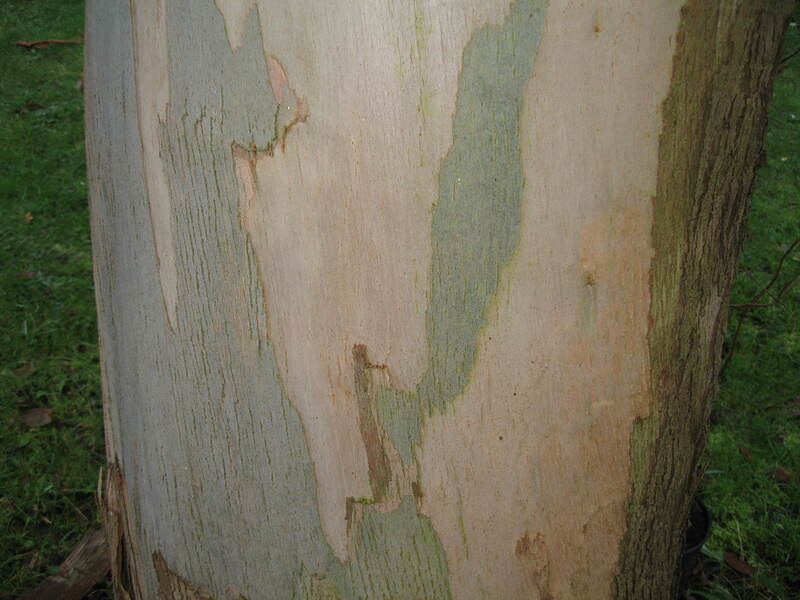 However, according to India Flint, eucalyptus is sensitive to the pH value & the mineral content of the water used for dyeing, so perhaps the reason for my failure to achieve red lies in the mineral content of our local water. Snow in our part of the south east of England is fairly uncommon & in many years we may see no snow at all. So it was quite a surprise to look out of the window this morning & see snow falling – not a lot, admittedly, but enough to warrant a photograph. 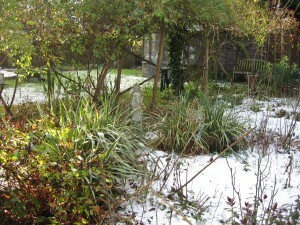 This photo shows a section of our garden under a light dusting of snow. It’s too cold to do much outside, so I’ll take this opportunity to catch up on some sample labelling & assembling – not a task I enjoy but one that has to be done. Our Christmas visitors have departed, the decorations have been taken down & my dyepots are ready & waiting. 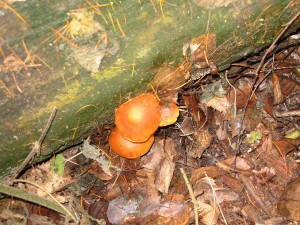 So it’s time for me to brighten the dull January days with some warm, glowing colours from the natural world. 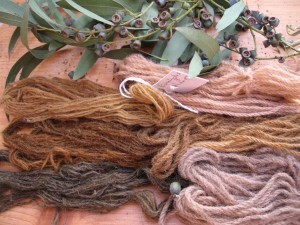 I wish everyone a Happy New Year & I look forward to sharing my dyeing activities with you in 2009. 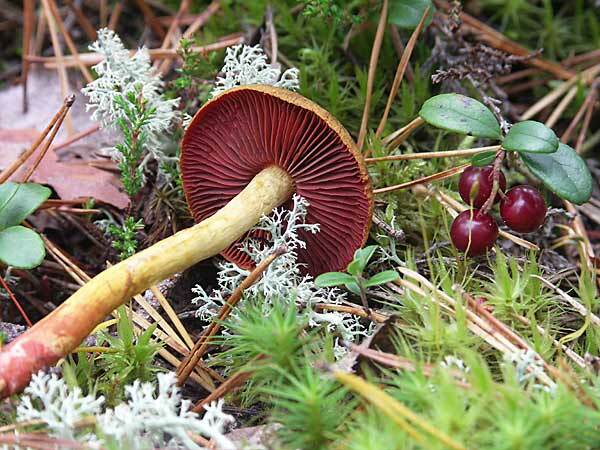 This lovely photo, kindly supplied by Leena in Finland, shows the fungus Cortinarius semisanguineus. I love this image – I can almost smell the musky aromas of the earth & the woods as I look at it. Thanks to Leena, who sent me some of this mushroom dried & ready for dyeing, I’ve been able to experience the delights of fungi dyeing for the first time, apart from some very primitive efforts many years ago. 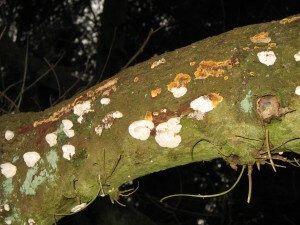 This photo shows the results of my experiments. 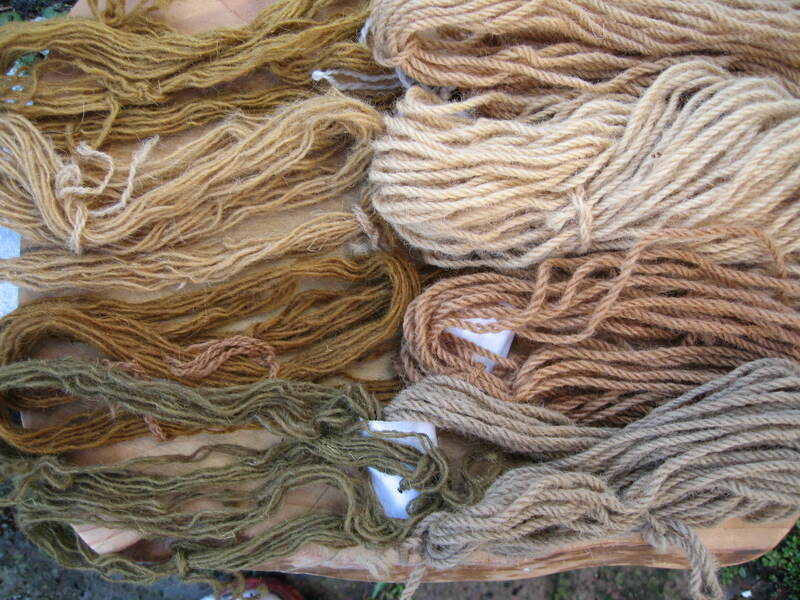 The skeins on the right were mordanted with alum & those on the left were unmordanted. The uppermost skein on the left was dyed in the same dyebath as the skeins on the right. 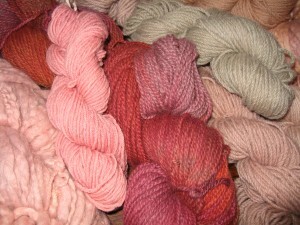 Otherwise, all the left-hand skeins were dyed in the exhaust dyebath. From top to bottom, the skeins on both sides show no modifer, acidic modifier, alkaline modifer, copper modifier & iron modifier. I simmered the mushrooms for about 1 hour to make the first dyebath, then simmered them again for a second batch of fibres.The dyestuff went a long way & I was able to dye about 400gms of wool with only 100gms of dye. This photo shows some more of the skeins I dyed using Cortinarius semisanguineus. Some skeins were mordanted with alum & others were left unmordanted. I was amazed at the lovely rich colours from this mushroom, which contains similar pigments to those in madder. 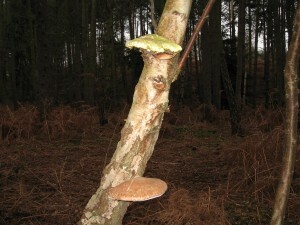 I am certainly a convert to dyeing with fungi & will now keep my eyes open for any I can harvest. 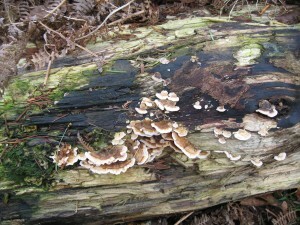 When the season is right, I’m sure I’ll find something worth trying, especially as we occasionally have various kinds of fungi appearing in our garden. All I need now is a good reference book to help me identify whatever I may find.